Every journey we organize is tailored upon our guests' requirements, so please contact us to request your private itinerary. Our private journeys are tailored around the passion of our guests. And Golf is certainly a passion, a special enthusiasm that a true golfer cannot leave at home while travelling around the world. Some of the World's best golf courses are by the sea, and the combination of golf and sailing deserves a special attention. We personally selected some of the best and classic golf courses around the Mediterranean, and we can arrange our flexible itineraries to allow one or more golfing experience within the cruise not to mention the dates before and after. We will take care of reservations and green fees, if you want. Our skippers will make sure not a single minute of your precious holidays will be lost. And our crews will prepare for you the perfect 19th hole, followed by a perfect gourmet dinner with local produce. We recommend to enjoy a golf and sail private journey where this great sport already achieved a high level of style. Provence and the French Riviera, Sardinia and the Balearics, although it would be a mistake to overlook the new courses in Croatia and Tuscany. Contact us for a private golf and sail journey. 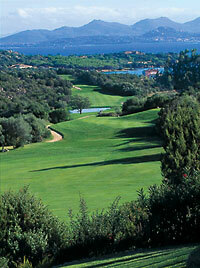 Pevero Golf Club, Northeast Sardinia. See our itinerary and bareboat base. 10% discount on the green-fee for our guests. Royal Golf de Mougins. See our Provence destinations. Golf & Coutry Club de Cannes and Mougins.